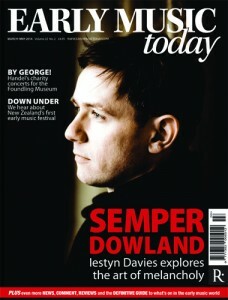 Iestyn Davies’ ‘Handel greatest hits’ disc is here, and it’s the oratorio repertoire for which he’s plumped first. Though it is of course a disc of lollipops in form, there is a clear set of intentions in its programming, set out in an excellent liner note by Donald Burrows. Burrows argues that Handel thought about his alto singers in terms of voice type rather than gender or vocal background, viewing, say, Caterina Galli and Gaetano Guadagni as more or less interchangeable musically; that all that was important was that the voice should be ‘tuneful’ (the disc’s title comes from an aria from Semele that forms Davies’ centrepiece). Certainly it is the case that Handel drew his soloists without prejudice from the Italian opera, the English theatre and London’s three principal ecclesiastical choirs. 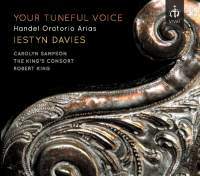 Davies is thereby justified in having chosen a selection of arias that fit him, though written for singers ranging widely from William Savage (in transition from treble to bass), to Susannah Cibber, mature by the time of Belshazzar’s writing. Davies is in his prime of vocal flexibility and authoritative in modes both pious (‘O sacred oracles of truth’) and warlike (‘Mighty love now calls to arm’). Two cameos from Carolyn Sampson are, naturally, ravishing.